Primatech Paper Company from Heroes exists online! 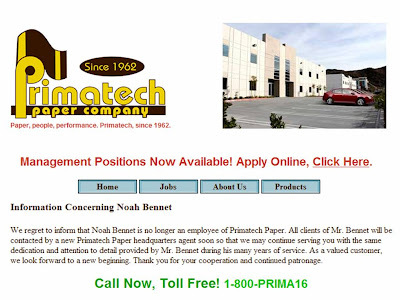 One of the central characters from Heroes, Noah Bennet, works for the Primatech Paper Company. There is a web address on the business cards that he gives out and this website actually exists at http://www.primatechpaper.com ! The creation of a real site for Primatech paper is a nice way of hiding a secret space within the TV programme and a clever way of creating a deeper engagement with viewers - it's made me even more intrigued about what will happen next!